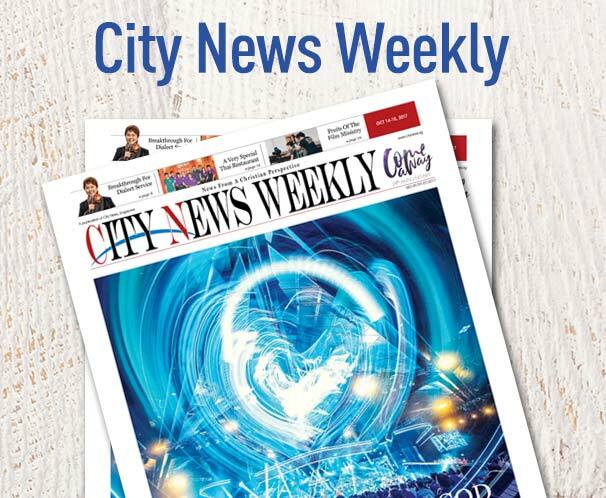 The Men’s Meeting on June 13 took the CHC’s Men’s Ministry to another level, fortifying the big changes experienced by the ministry over the last few months. CN PHOTOS: Daniel Poh & Henzy David. As this male writer sat in a sea of chanting Manchester United and Liverpool football fans, clad in their familiar red jerseys—in tribute to the on-going World Cup—he watched as cold frosty beers (all right, root beers) were passed out to the rowdy crowd. 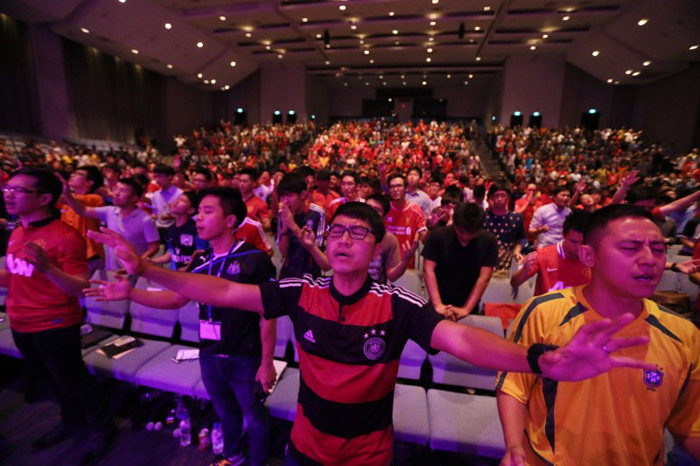 With the men encouraged to don their favorite team’s colors, the atmosphere for the night’s City Harvest Men’s Meeting was closer to one of an English Premier League match than a Christian meeting. 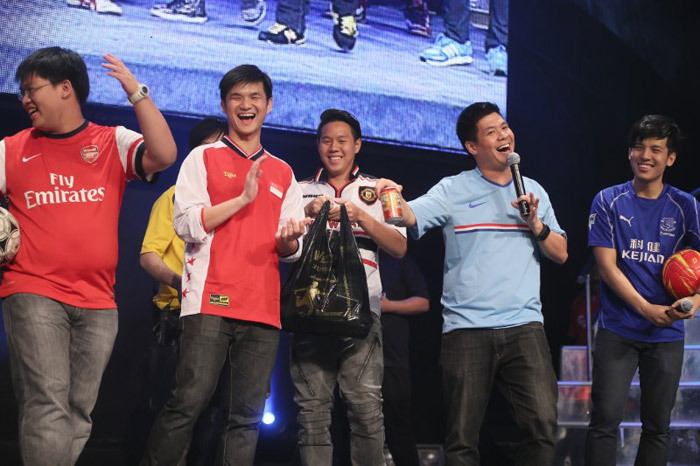 As City Harvest Church’s executive pastor Aries Zulkarnain opened in prayer, he laid down the unequivocal mantra that marks the Men’s Ministry of the church: “We are male by birth, but men by choice”. 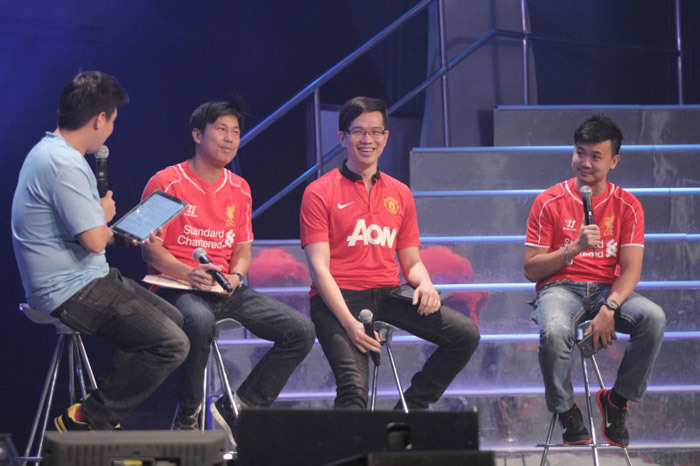 The football theme played a big part in the night’s proceedings, with the program being broken down into two distinct halves; the first half featuring a no-holds-barred Q&A session called Heart to Heart involving pastors Aries Zulkarnian, Bobby Chaw and Wu Yu Zhuang, and the second half featuring a preaching session by Chaw. 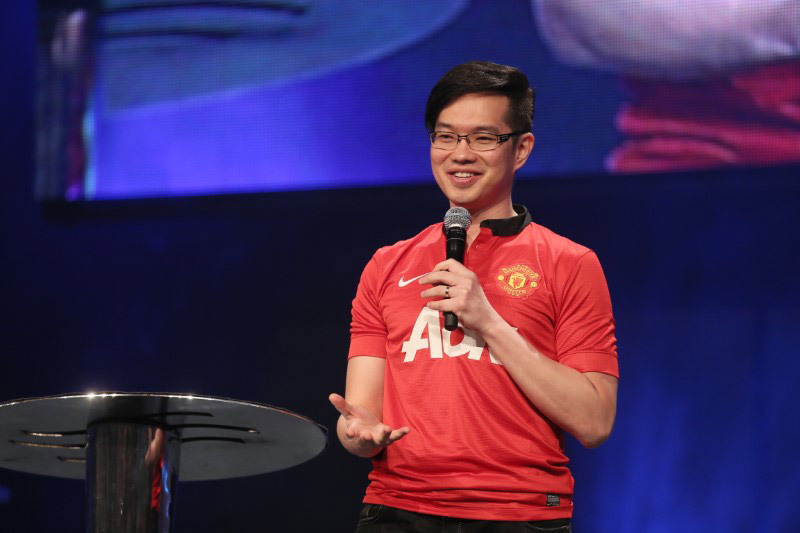 With much hilarity, facilitator Bernard Loh kicked off the first half of the night by displaying the fresh-faced wedding photos of each pastor on the huge overhead screens, sending the audience into unbridled cheers and chuckles. With the ice broken and the audience cheering for more, Loh launched into the very candid Q&A session revolving around the topics of marriage and its challenges, fatherhood and singlehood. One question, for example, dealt with conflict management: How does one who is married to a strong-willed wife take a position of leadership in the household? The pastors’ responses were equally candid, informative and extremely amusing as each shared from his heart. One of the funniest moments of the night was Zulkarnain’s take on the idea of work-life balance. Midway, his explanation unexpectedly veered off into the area of sexual needs in a marriage. Evolving from work-life balance to work-life expectation and then to vulnerability and sexual needs in a marriage, he explained the importance for a husband and wife to be open and honest with their sexual needs. “If my wife can’t help me, then who else? My members cannot, right?” he joked. The ensuing howls of laughter shook the building. The second half of the night kicked off with Chaw’s inspiring sermon on holiness. Quoting from 1 Peter 2:9 (NKJV): “But you are a chosen generation, a holy nation, a royal priesthood,” he emphasized that the man of the house is the priest of the house and, as such, it is his responsibility to lead his house in holiness. He highlighted the importance of spending quality time with God, saying that quality time is not an option but a must, and that God can use anyone who gives Him time and space. He equated quality time with being a holy moment; when God can touch the heart of a surrendered believer, his strength can be renewed and he can be further drawn into the presence of God. As the night ended in prayer with a strong call for men of CHC to lead a life of holiness, this felt like a watershed event for the men’s ministry of CHC. The night not only brought with it a tangible sense of God’s power and holiness but also showed the fun aspect of men corporately pursuing Christ-likeness in their lives. With more men’s events and workshops planned in the coming months—including a barbecue—all CHC men reading this are urged not to miss out on the mighty move of God that is sweeping through the Men’s Ministry now.